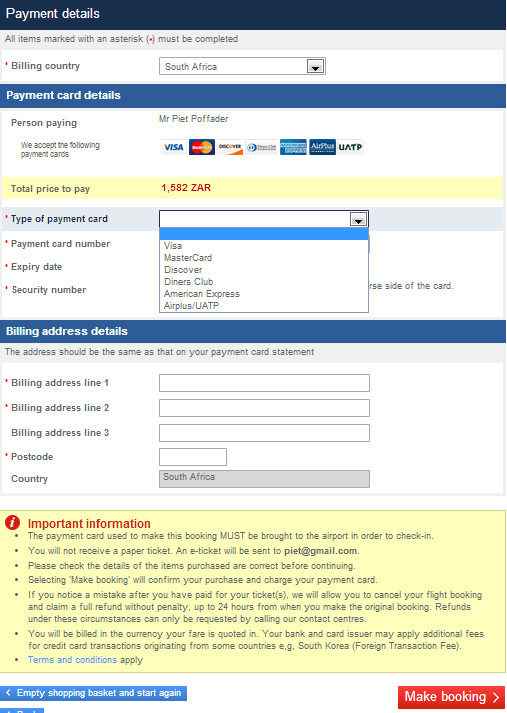 British Airways flight reviews might earn you an exclusive SouthAfrica.TO flight discount voucher - all you have to do is email a writeup of your flight to travel@southafrica.to and we'll send you travel voucher (tip: writeups with photos earn more). Get all the details here. Don't be shy - Ask for Help - our travel agents are itching to show you the best flight deal. British Airways Comair is rated 4.5/5 based on 12 customer reviews. There are 2 British Airways! On domestic and regional flights from South Africa (e.g. Johannesburg to Cape Town and Johannesburg to Windhoek) you're flying on British Airways operated by Comair, which are BA flights operated by a local based company called Comair. On international flights from South Africa to London and beyond you're flying with BA PLC which is based in London. This page is about British Airways operated by Comair. British Airways is a UK based airline, predominantly operating flights from London. Its South African franchise is run by Comair (which also flies the Kulula brand). The reason for this is that South African aviation law only allows scheduled flights in South Africa to be operated by companies which are at least 75% South African owned. Comair also operates Kulula Airlines flights. British Airways operated by Comair's baggage policy differs from British Airways PLC's policy, so it is worth checking which airline you are travelling on to be sure about your checked luggage allowance. This bagage policy generally applies to British Airways domestic and regional flights in South Africa. 25 October 2018: British Airways has been recognised as the top airline in the Airline Industry Category at the 17th annual Ask Africa Orange Index awards ceremony. This award recognises the airline for service excellence. This is the third time the airline has taken home the award. 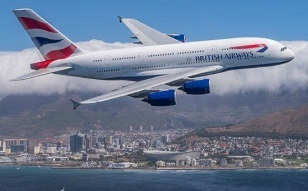 28 November 2016: British Airways operated by Comair has announced that they are now charging for pre-seating, with costs ranging from R64 to R144 depending on the duration of the one-way route. Passengers will still be able to do pre-seating free of charge during the online check-in stage or when checking in at the airline counter. The best advice would be to do your pre-seating as soon as the online check-in opens. Please note that further restrictions apply. No monster bags are allowed - the bag may not be more than 90cm x 75cm x 43cm. If your bags weigh more than 23kg but less than 32kg will be charged a Heavy Bag Charge. Bags that weigh more than 32kg must be transported as cargo. Bags carried in addition to the Free Checked Baggage Allowance will be charged an Extra Bag Fee. Be sure to lock your baggage up securely, as it's been known for items to go missing. TIP: Pay for your extra bags or heavy bags online, it's cheaper than paying at the airport. Hand Baggage: Restricted to 1 piece per customer (weighing no more than 7kg with dimensions 56cm x 36cm x 23cm (115cm) + handbag or laptop or briefcase. If you are carrying heavier than your hand baggage allowance (weight, size or pieces) you will be referred back to check-in to check this baggage in and will pay any applicable fees. This may result in the customer being offloaded and any expenses incurred will be at the expense of the customer. In the event that Comair carries hand baggage in the aircraft hold due to unforeseen circumstances then all valuables must be removed from the baggage as Comair does not accept liability for loss of valuables carried in checked baggage as per Comair’s Conditions of Carriage. If you require information about the UK visa application process then please navigate to this page. 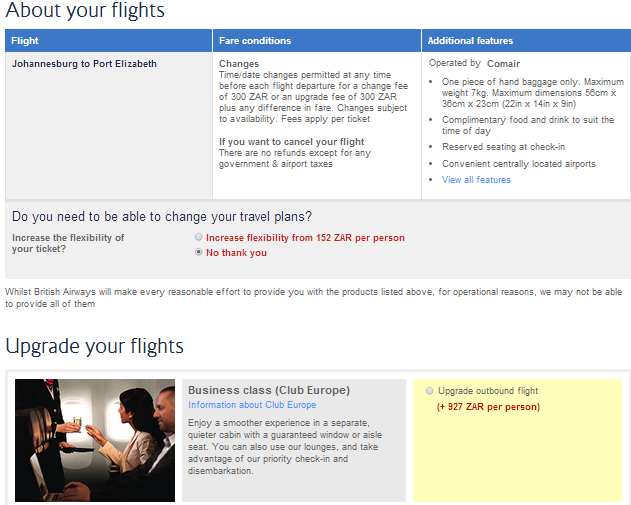 BA Comair's meal policy differs from that of BA international. Since 15 March 2012 they will no longer serve Woolworths meals on board British Airways Comair flights. Instead, Food Directions, Comair's homegrown catering company, will be providing the food. British Airways offers frequent flier miles to members of its executive club (their equivalent of South African Airways' Voyager program). Click on this link to enrol in British Airways Club Class and start enjoying the benefits (miles, separate check-in queues at some airports, etc...). In September 2013 BA launched a lifetime Gold membership for members who gather 35,000 or greater points over the course of their lives. Lifetime Gold Membership offers members double avios miles for their BA flights, an additional checked luggage allowance, the ability to take a guest in with them to BA's airport lounges, ability to reserve some of the best seats on the plane and first class check-in with oneworld & BA. 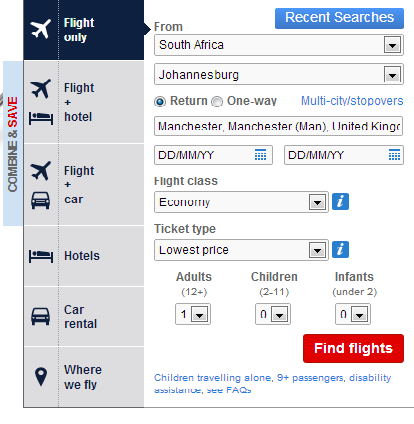 Step 1 : Navigate to the British Airways bookings page. Notice the booking engine on the left. Fill in where you want to fly from, to, whether you want a one-way or return flights, your outbound date, return date, the flight class you prefer, how man adults/children/infants and then click the red "Find flights" button. Step 2 : The flight times as well as the flight numbers (e.g. 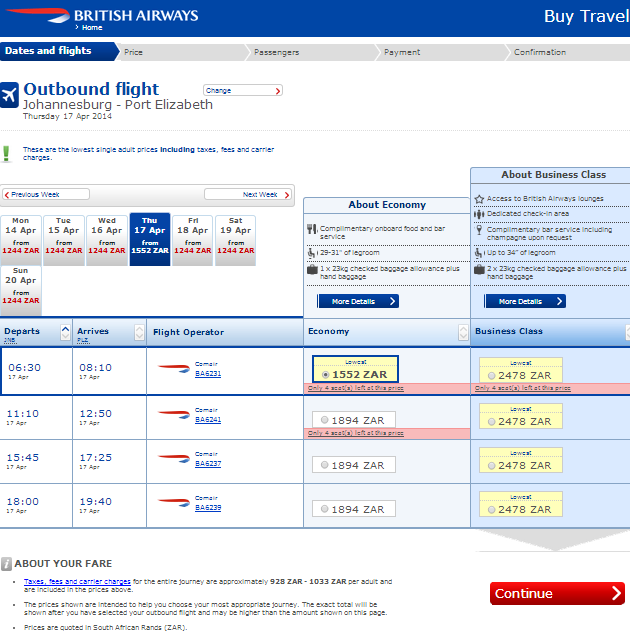 BA6231) are shown, as well as all economy and business class airfares. A warning is given if there are only a few seats remaining. Select your preferred flight and class and then click the red "Continue" button. 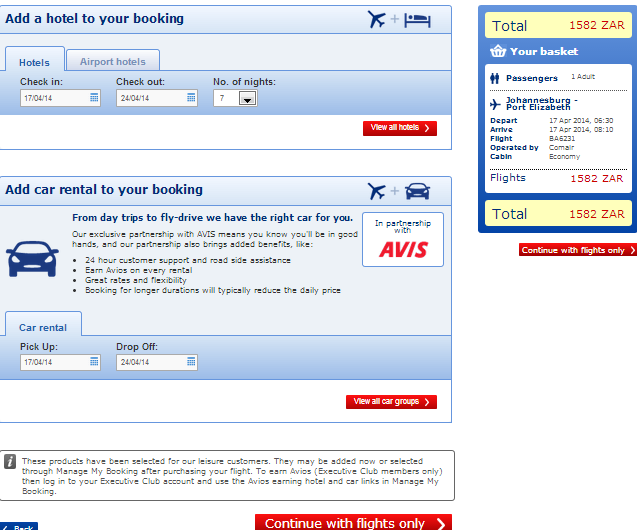 Step 3 : After checking that you're happy with your flight price scroll down a bit. If you have a promotion code or an eVoucher, then fill in the details. Step 4 : Scroll down a bit further, and you then have the opportunity to pay a bit more to increase the flexibility of your flight or to upgrade your flight. 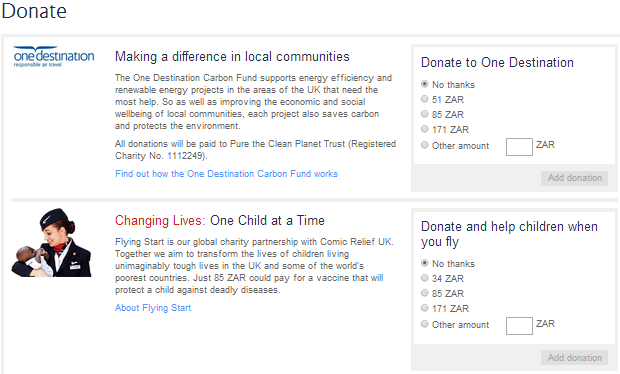 Step 5 : Scroll down a bit more and you have the opportunity to donate to charity - One Destination or Changing Lives one Child at a Time. Step 6 : If you are happy with everything on the page, then scroll down a bit more and click the "I agree to the statement above" and then the red "Continue" button. Then a screen will pop up asking whether you want to add a hotel or car rental booking. If you only want to book flights, then click the red "Continue with Flights Only" button. 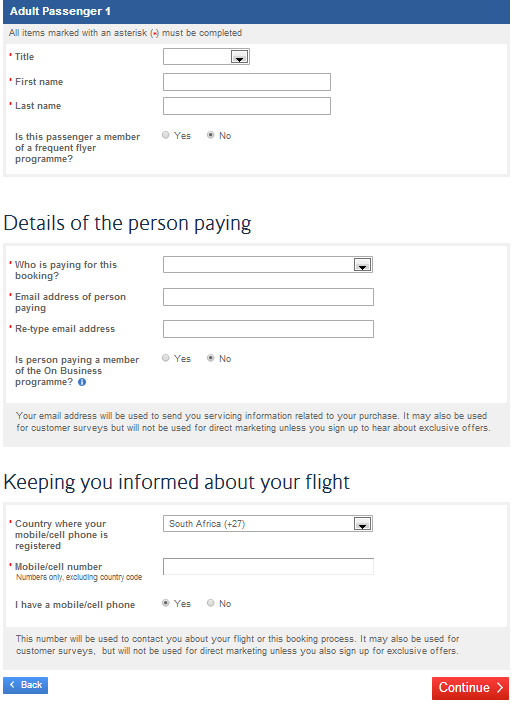 Step 7 : You will then be prompted to fill in the passenger details. Make sure that the details you fill in are exactly the same as on the passport or other travel documents you are using. You also provide your cellphone number to ensure you are informed about any changes. Step 8 : Then select your payment method. You have the option of paying with Visa/Mastercard/Discover/Diners Club/American Express or Airplus/UATP. Note that the credit card used must be presented at check-in. Click the red "Make Booking" button to finalise your reservation. British Airways operated by Comair has a large variety of Boeing 737's, including eleven Boeing 737-300's, seven Boeing 737-300's and one Boeing 737-800, which is also their newest aircraft. "We're very happy to welcome the first Boeing 737-800 into our fleet as part of our overall Comair strategy. The total investment in the fleet upgrade is going to be around R3.5bn. The investment upgrade started in 2012 when we initially invested in our Kulula fleet. It formed part of 4 brand new aircraft plus 5 additional aircraft which essentially replaced all of the Kulula 737-400 fleet. The new aircraft will be carrying 158 passengers, and we will have 20 passengers in our Club Configuration as well as 138 passengers in travel. The aircraft themselves represent an 18% fuel saving, so in real terms we save around 2 million litres of fuel p.a. We are constantly looking to improve service and value in terms of our overall customer proposition, and this needs to be seen in light of running a sustainable airline business" said Iain Meaker, Commerical Distribution Executive at Comair, in September 2013. In August 2013 BA Comair will deploy its first Boeing 737-800. South African Technical (SAT) have been appointed to repair and maintain the aircraft of BA South Africa. In SouthAfrica.TO's experience British Airways offers superior service in terms of aircraft design, meals, check-in queues and marketing. Here's our analysis of British Airways versus South African Airways.